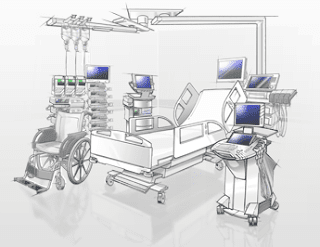 Hospitals are complex environments that encompass multiple sophisticated, mission-critical medical, infrastructure and operating systems. Engineering is an essential element of hospital design and engineers are integral to smooth hospital operations and efficient service delivery. Every hospital requires engineering services that include civil, electrical, bio-medical and other services. Hospital engineers also design safe work practices and emergency safety procedures, and train staff in implementing them. Civil services for hospitals are similar to those required for many large public facilities. Hospital engineers are involved in designing, operating and maintaining buildings and infrastructure as well as systems for safely and reliably providing water, sewage removal, heating, ventilation and air conditioning (HVAC) and lighting. Because hospitals must remain operational during natural and man-made disasters, their buildings must be able to withstand earthquakes, cyclones, and blasts. In areas where radioactive materials are used, such as nuclear medicine and radiology departments, strict guidelines requiring lead shielding and disposal units must be followed. Other areas might require special sound-proofing or air purification systems. Maintenance of electrical services is particularly critical for hospitals since lifesaving equipment is dependent on reliable electric supply. As such, most hospitals have backup generators in addition to standard electric supply. Electrical engineering services are also responsible for electric fittings and installation, elevators, fire protection and refrigeration. Many hospital departments and medical specialties are highly dependent on sophisticated biomedical equipment that engineers must calibrate and maintain in perfect working order. Hospital engineers are responsible for imaging equipment such as X-ray machines, MRIs, CT scanners and ultrasound machines. Sensitive diagnostic and therapeutic equipment is at the heart of endoscopy, cath and pulmonary labs. Operating theaters and intensive care units are similarly equipped with equipment that is dependent on reliable supplies of electricity, oxygen and other gases, while labs and blood banks require centrifuges, powerful electric microscopes and refrigerators. Hospital engineering staff is responsible for hospital laundry facilities, sanitary services, communication systems, cable television, public address and paging systems, incinerators and disposal of toxic, infectious and radioactive waste, security systems, and transportation for patients, visitors, staff and records. Increasingly, hospitals are installing energy-saving systems such as motion sensors to control lighting and HVAC use, automatic window shades that balance artificial and natural light, and solar panels, and hospital engineers are responsible for ensuring the proper operation of all these systems. Great post, hospital engineering is definitely complex.